The Davis Methods offer a drug-free approach to successful management of ADD or ADHD (Attention Deficit Disorder, or Attention Deficit Hyperactivity Disorder). The difference between someone with dyslexia and someone with ADD or ADHD is, they are using their unique thinking style more often or spending more time doing it. So the symptoms of their dyslexia are amplified and therefore look like different symptoms altogether. The Davis procedures have produced dramatic improvements and, help the ADD or ADHD child (or adult) to achieve self-control and overcome problems with focusing, attention and staying on task. In The Gift of Learning Ron Davis discusses how the both the “hyperactive” and the “daydreamer” forms of ADD and ADHD can be helped. As with all Davis programs the client learns tools to focus and adjust their energy to the situation. They learn important social skills by beginning to differentiate between consequences wanted and those not wanted. Everyone with ADD (Attention Deficit Disorder) has different areas of weakness. Davis tools deal with them all - the problems of staying focused and on a task, problems organizing their lives and belongings, planning and organization, impulsiveness, and inappropriate social behaviors or day-dreaming. As with all Davis programs, the client learns tools that help with focus and attention, and they learn to recognize and manage their energy level. Further, they master basic ideas called core concepts about how the world works. 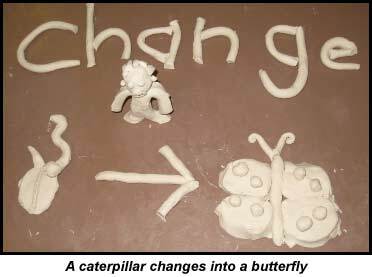 Clients use clay and their innate picture thinking ability to master concepts such as change, consequence, and time. These models become the basis for a client's new way of thinking and dealing with their environment. Below is an example made by a 10 year old. The Davis Dyslexia Correction program is usually done first because the dyslexia program itself “eliminates” the causes of the ADD/ADHD issues and very often produces dramatic improvement in hyperactivity. Depending on results from the initial program, if problems persist a subsequent Davis program of Attention Mastery or Math Mastery can be done. Professional services described as Davis™,Davis Dyslexia Correction®, Davis Symbol Mastery®, Davis Orientation Counseling®, and Davis Math Mastery® may only be provided by persons who are employed by a licensed Davis Specialist, or who are trained and licensed as Davis Facilitators by Davis Dyslexia Association International. Carl Nigi is an Ottawa based Licensed Davis® Facilitator.